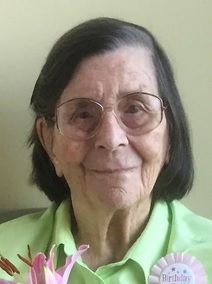 Virginia Kelley died on July 20, 2018 while visiting Green Lake Park in Seattle, WA. at the age of 105. She is survived by her daughter Joan Ritzenthaler and her husband Tom. Virginia was born on February 28, 1913 in Baltimore, Maryland to Frank and Virginia Robinson. In her late 20’s, because of her love of the outdoors and mountains, she moved on her own to Denver, Colorado, after having taken a solo train trip to the west coast to visit her father in southern California. In Colorado she met her future husband while climbing a 14,000’ peak. They married in 1948. Her husband’s career moved them to College Station, Texas for one year, then to Los Altos, California, and back to Denver, Colorado, where the family was able to pursue their love of hiking, backpacking, mountain climbing, skiing, and travel. Virginia volunteered at various hospitals and libraries, and was quite involved in conservation issues, writing letters, and testifying at hearings. Virginia was a remarkable woman with a great sense of humor who undertook many adventures during her lifetime, including climbing the Grand Teton and Mt. Fuji. Following her husband’s retirement, they moved to Seattle in 1973. Following his death in 1982, she travelled with Elder Hostel (now Road Scholar) to Australia, New Zealand, Scotland and Iceland. Virginia was always on the move, and staff and residents of The Hearthstone remember her riding almost all of King County Metro’s bus routes. She was always smiling and greeting strangers. A memorial service will be held at The Hearthstone, 6720 E Green Lake Drive N, Seattle, WA. 98103 on Thursday, August 2 at 2:15PM. In lieu of flowers, donations may be made to End of Life Washington, PO Box 61369, Seattle, WA. 98141. We appreciate the caring staff at The Hearthstone for their dedication, where she lived for 18 years, and Evergreen Hospice.